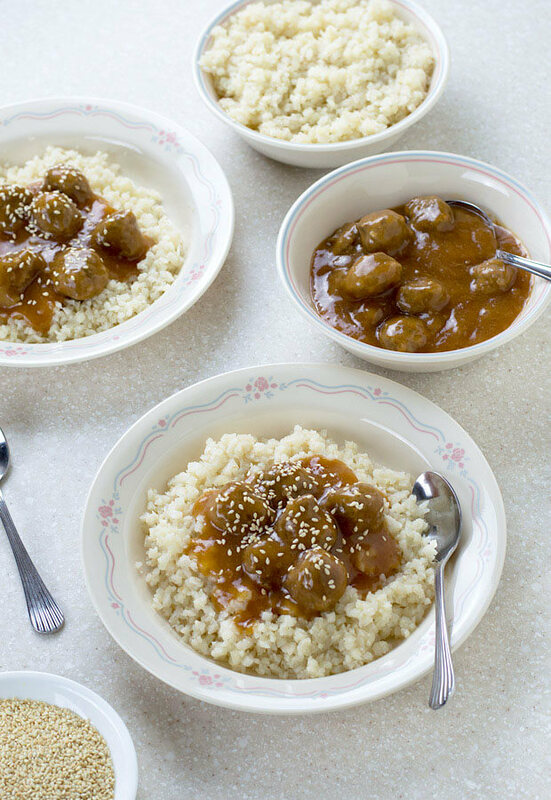 Loosely based on Chinese sweet and sour chicken, these sweet and sour meatballs are always an instant hit! I’ve made these when I wanted to make a quick tasty meal. Or, even if I’m going to a party and have to bring a dish to share. 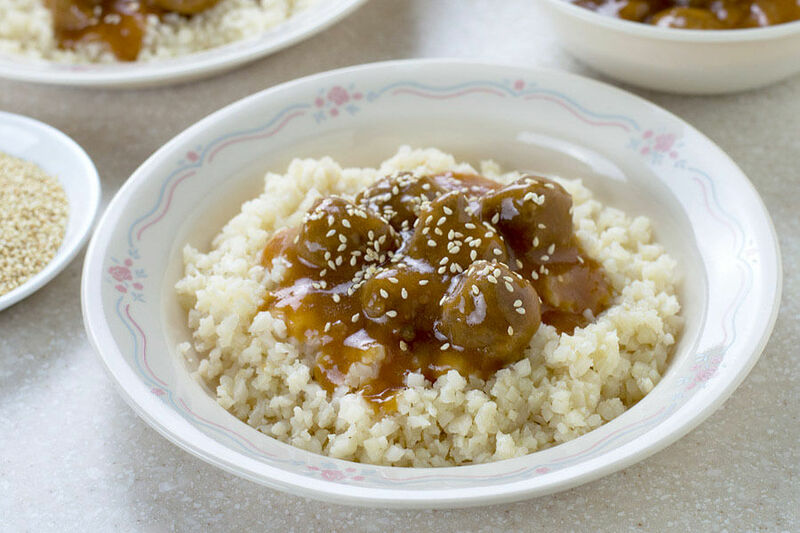 Just toss on top of some cauliflower rice for a complete meal, or serve the meatballs using some toothpicks for a snack. I wanted to create a simple meatball recipe to go with the sauce. I kept the meatballs simple by using parmesan cheese and onion powder to flavor them. For the sweet and sour sauce, I opted to use apple cider vinegar in place of rice vinegar. And I added a little more sugar free ketchup to increase the tanginess. The sauce can be made by almost anyone – with common low-carb ingredients that are in most people’s kitchen! 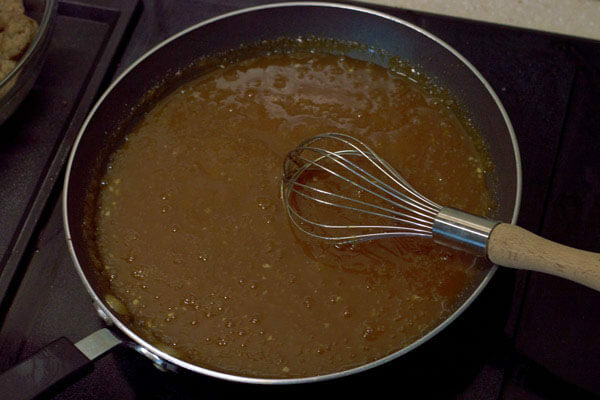 To thicken the sauce, I whisked in a small amount of xanthan gum. You can use more or less depending on the consistency you desire. The trick is to slowly whisk in the xanthan gum, and wait a few minutes before adding more in. It will thicken faster than you know it, and you don’t want to over do it. 1. In a large mixing bowl add ground beef, an egg, grated Parmesan cheese, and onion powder. Mix together with your hands. 2. Then, using a tablespoon to measure, shape the meatballs. You should be able to form 30 mini meatballs. 3. Preheat a saucepan on medium heat. Add the meatballs and cook until browned on the outside. If it’s slightly pink in the middle, that’s okay for now. Put to the side. 4. In the same sauce pan add the water, apple cider vinegar, soy sauce, sugar free ketchup, and erythritol. Use a whisk to stir until the sauce comes together. 5. Slowly whisk in the xanthan gum. You want to stir in a little at a time, waiting a couple minutes in between to make sure it thickens. Lower the temperature, and let the sauce simmer on low. 6. After a couple minutes, check the sauce to make sure it’s the desired consistency. You can dip a spoon into the sauce to see if it coats the back. If you run your finger across the back of the spoon, a thickened sauce will not immediately run back together. Just be careful not to burn yourself. 7. 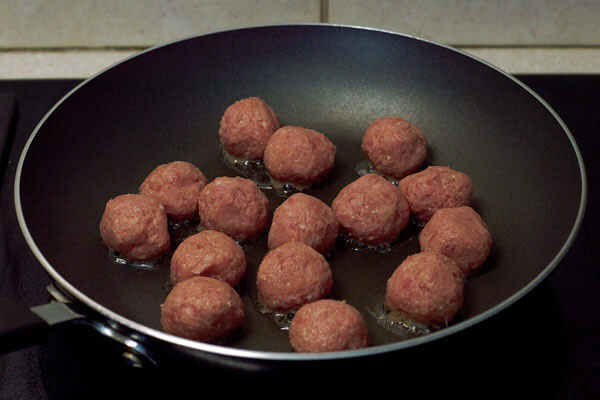 Add the meatballs, and let them simmer on low for 10 minutes or until the meatballs are fully cooked through. 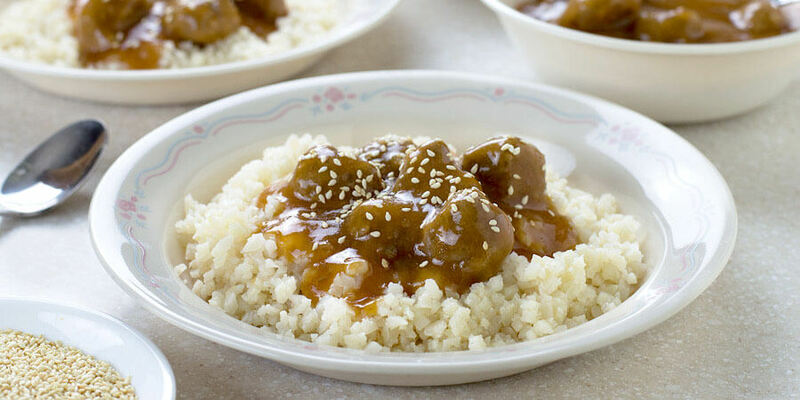 This makes a total of 5 servings of Sweet and Sour Meatballs. Each serving comes out to be 295.4 Calories, 18.66g Fats, 5.35g Net Carbs, and 28.26g Protein. 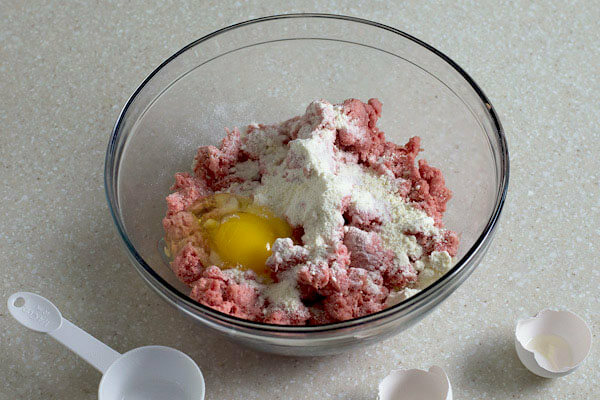 In a large mixing bowl add ground beef, an egg, grated Parmesan cheese, and onion powder. Mix together with your hands. Then, using a tablespoon to measure, shape the meatballs. 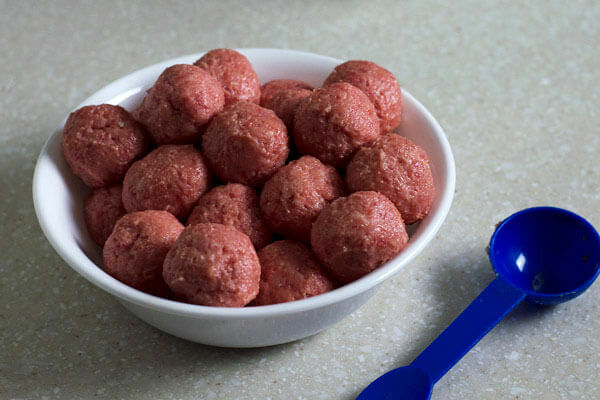 You should be able to form 30 mini meatballs. Preheat a saucepan on medium heat. Add the meatballs and cook until browned on the outside. If it’s slightly pink in the middle, that’s okay for now. Put to the side. 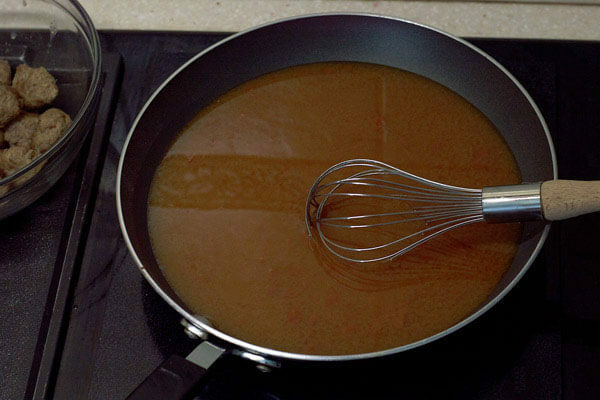 In the same sauce pan add the water, apple cider vinegar, soy sauce, sugar free ketchup, and erythritol. Use a whisk to stir until the sauce comes together. Slowly whisk in the xanthan gum. You want to stir in a little at a time, waiting a couple minutes in between to make sure it thickens. Lower the temperature, and let the sauce simmer on low. After a couple minutes, check the sauce to make sure it’s the desired consistency. You can dip a spoon into the sauce to see if it coats the back. If you run your finger across the back of the spoon, a thickened sauce will not immediately run back together. Just be careful not to burn yourself. 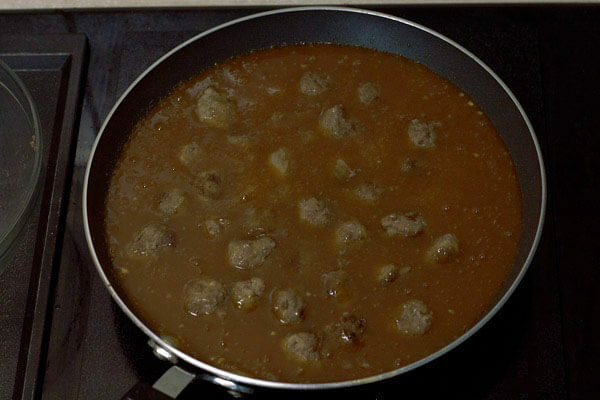 Add the meatballs, and let them simmer on low for 10 minutes or until the meatballs are fully cooked through.